New Moscow Map – Photo by Dizaino Studjia Baklazanas (D.S.B.). After Donald Trump’s election, there’s a growing apprehension between the Baltic countries and Russia. 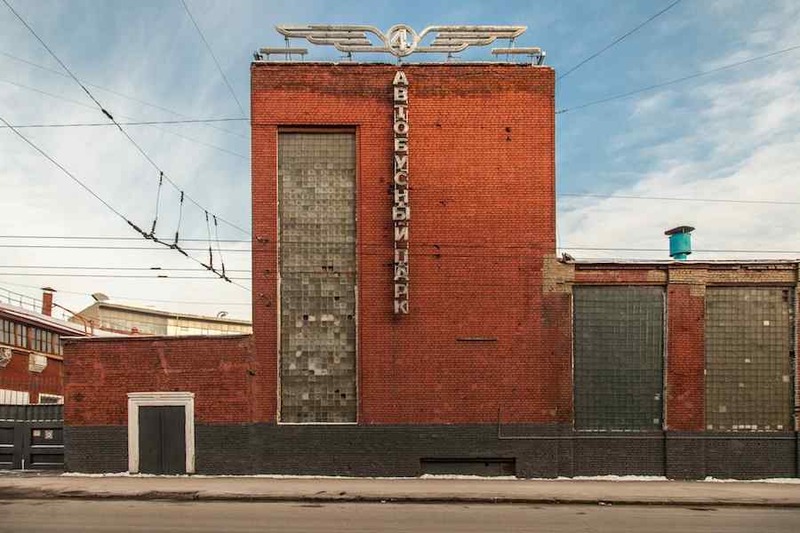 Beside that, Vilnius-based Dizaino Studija Baklazanas teamed with Center of Russian Avantgarde in Moscow to map a disappearing architectural heritage. From Melnikov House and the Narkomfin Building to Shukhov Tower and even Lenin’s Mausoleum in the Red Square… Many Constructivist world-famous buildings and less known masterpieces in Moscow are either in ruins or under threat of demolition. Mossovet Truck garage now Bus Garage N4 1926-1929. Architects K.S. 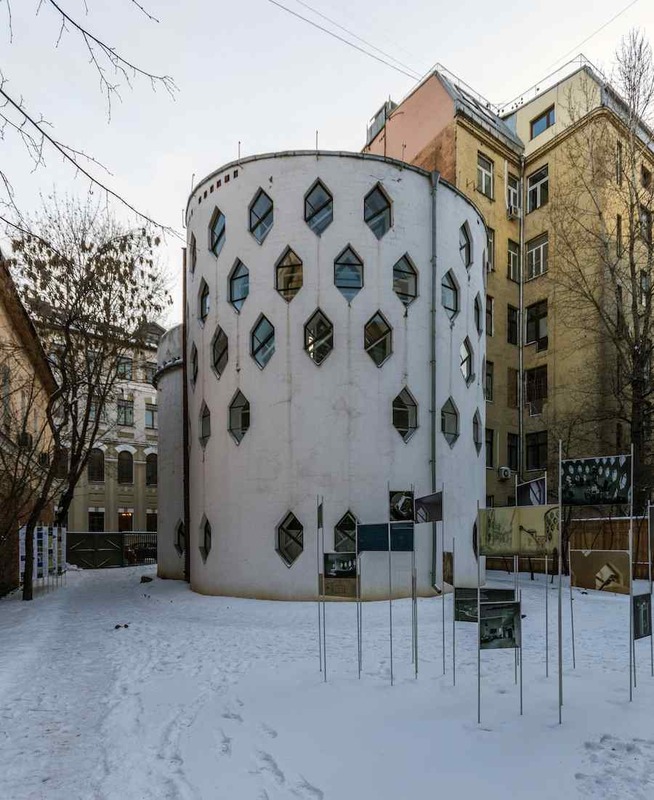 Melnikov, V.G. Shukhov – Photo by Sergey Norin, Flickr CC. 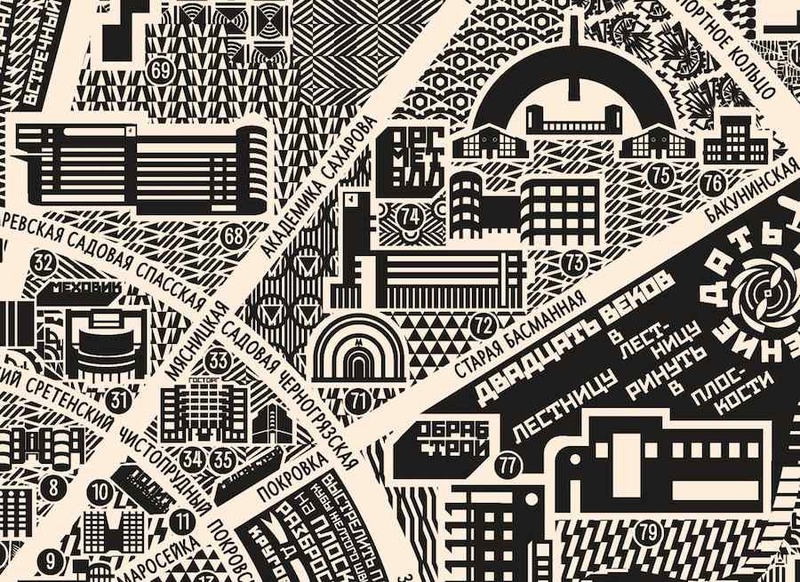 The graphic-design highlights over 180 neglected avant-garde buildings in the Russian capital. 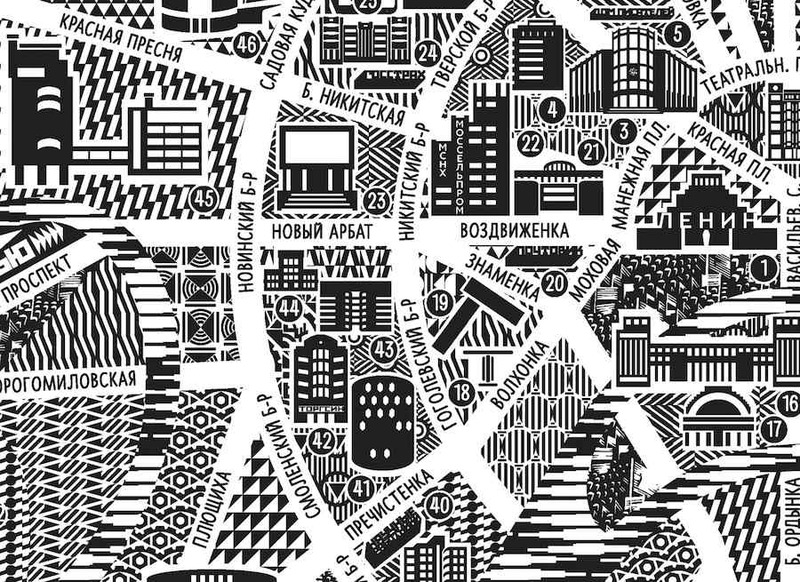 Not only architecture icons, but also residential buildings, constructivist districts and settlements within the limits of Moscow Ring Road (MKAD). The map features workers’ clubs, schools, factory kitchens, garages, communal housing, factories, bathhouses and even the first soviet crematorium and columbarium. New Moscow Map – Image by D.S.B. Despite all the public protests and numerous petitions, Russia’s unique architectural heritage is actually being destroyed by the authorities very fast. 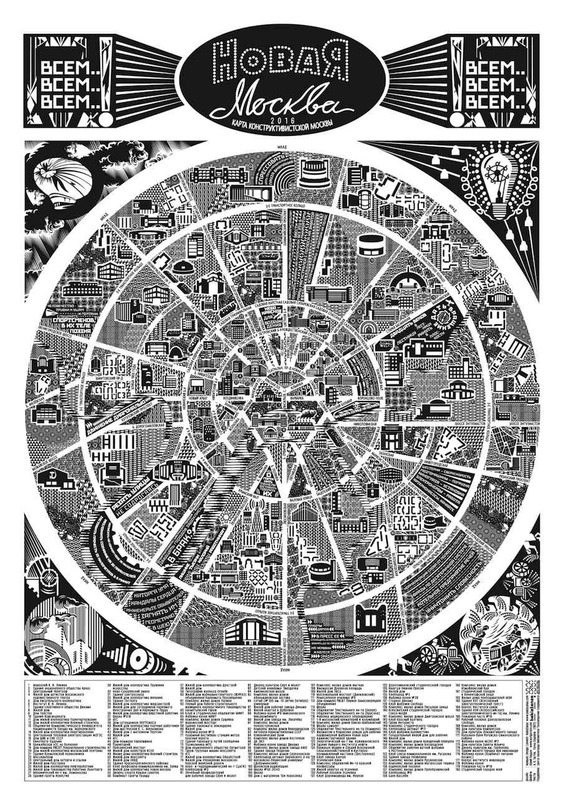 “Mostly because recently Moscow has been changing greatly” say at Dizaino Studija Baklazanas to Archipanic. 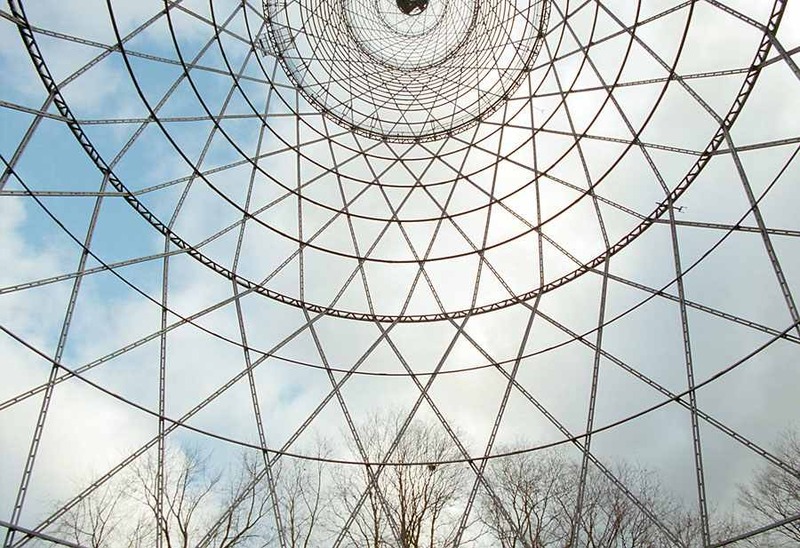 The Shukhov communication tower – Photo by Patrick Lauke, Flickr CC. “As the land and the property are extremely expensive, the authorities prefer to demolish a lot of unique buildings and sell the land to the developers. We are all rapidly losing avant-garde monuments that literally influenced the entire contemporary architecture all over the world”. New Moscow Map – Photo by D.S.B. Constructivist buildings were neglected for much of the Soviet period since late 1930s and people nowadays don’t appreciate this unique heritage. “Which is one of the very few things Russians should be actually proud of. Many people see avant-garde buildings as something ugly, too Soviet or simple-looking, which in Russian mindset is also bad”. 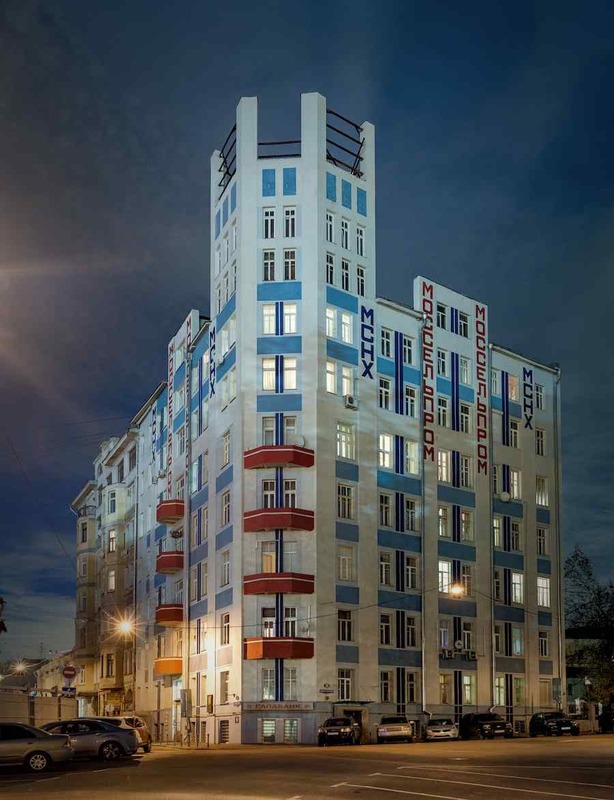 Not only leading examples of Moscow Constructivist architecture. Dizaino Studija Baklazanas included also some remarkable elements of Russian industrial art from the 1920s and 1930s, a font by famous Russian type designer Yuri Gordon and proletarian poetries from the 20s. 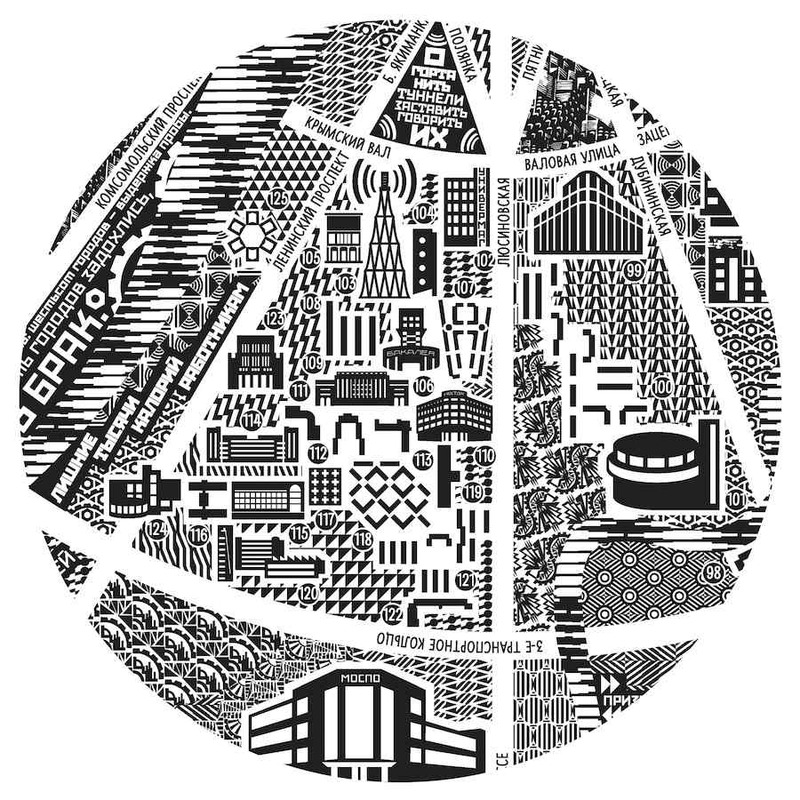 Dizaino Studija Baklazanas is an architecture and graphic design studio based in Vilnius, Lithuania. The country became independent from Soviet occupation just over a quarter of a century ago. After new president-elect Donald Trump’s statements, many fear that if US loosens on NATO commitments, there might be a safety issue between the Baltics and Russia. Mosselprom building – Photo by Andrey Kryuchenko. 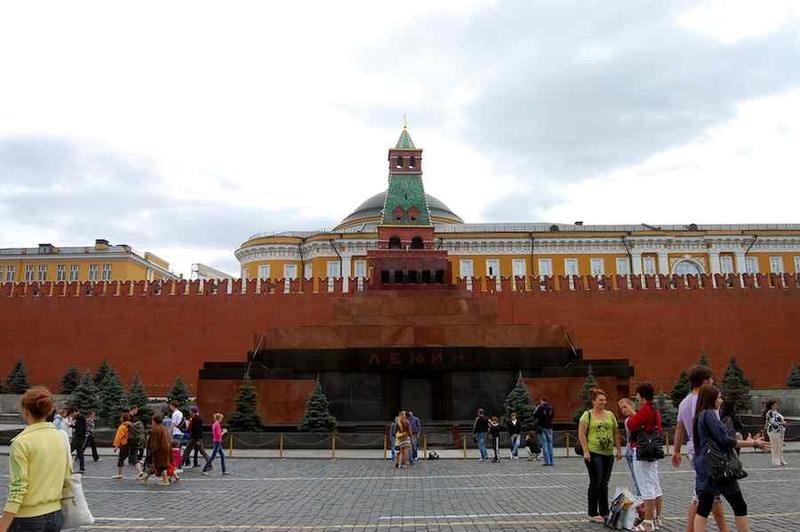 ArchiPanic: Architecturally speaking, which is the relation between Lithuania and Russia? Dizaino Studija Baklazanas: “Well, in the 1920s Lithuania ahs also experienced the influence of avant-garde and modernist ideas which were brought by the Lithuanian architects who studied abroad. Kaunas, the former capital of Lithuania at that time, was extensively looking for its own identity and it still has many wonderful functionalist buildings”. 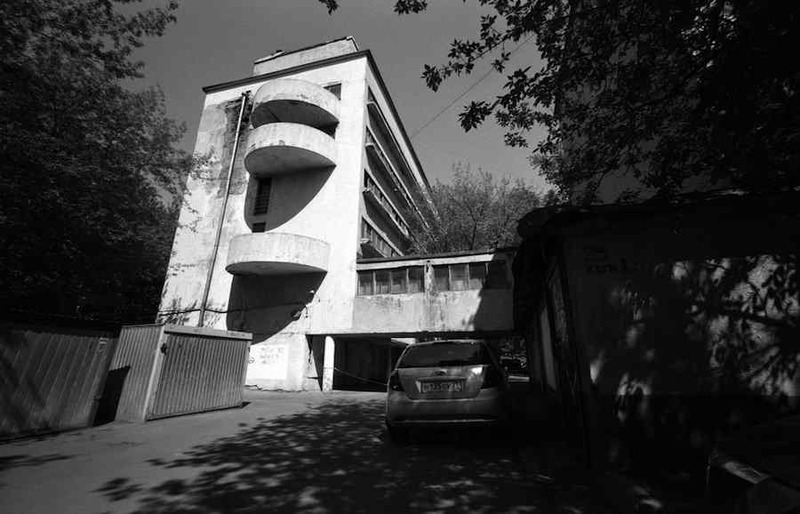 “But the main thing is that we don’t see Moscow avant-garde architecture as something only Russian or related only to Moscow. Just like we don’t refer to Bauhaus as to something exclusively German. It’s world heritage and it should be saved. For example, if the famous Egyptian Pyramids will be in danger one day, we will also make a social responsibility campaign to protect them for sure”. Lenin Mausoleum – Photo by yaili, Flickr CC. Baklazanas is a nomadic design studio from Lithuania focusing on visual branding and communication design for cultural, educational and governmental institutions. “One of our latest project ‘Save My Speech Forever’ has won a European Design Award. 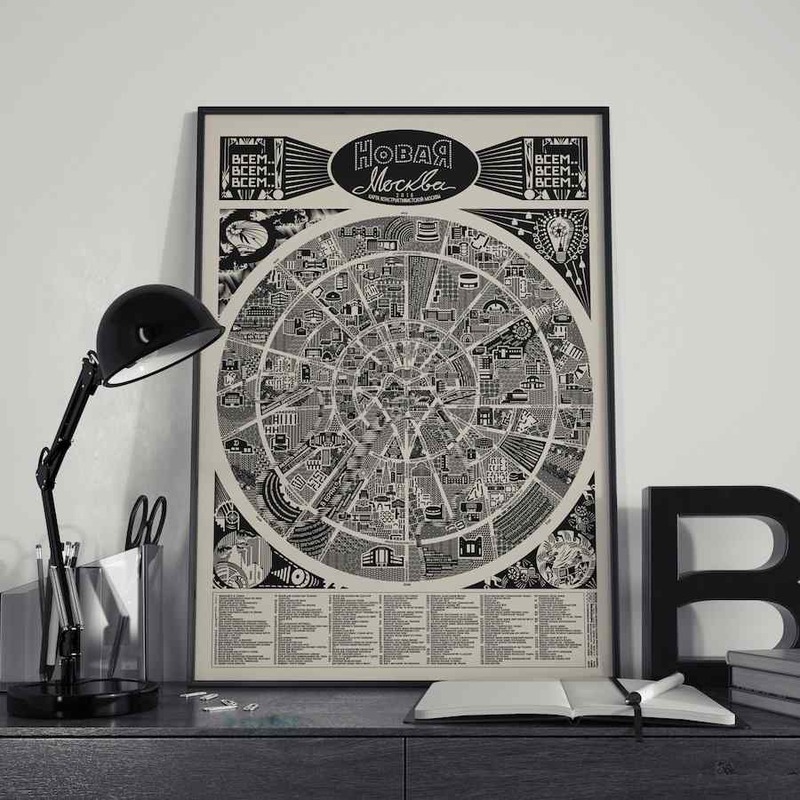 Our ‘Save Shukhov Tower!’ poster campaign won the Red Dot Design Award”. 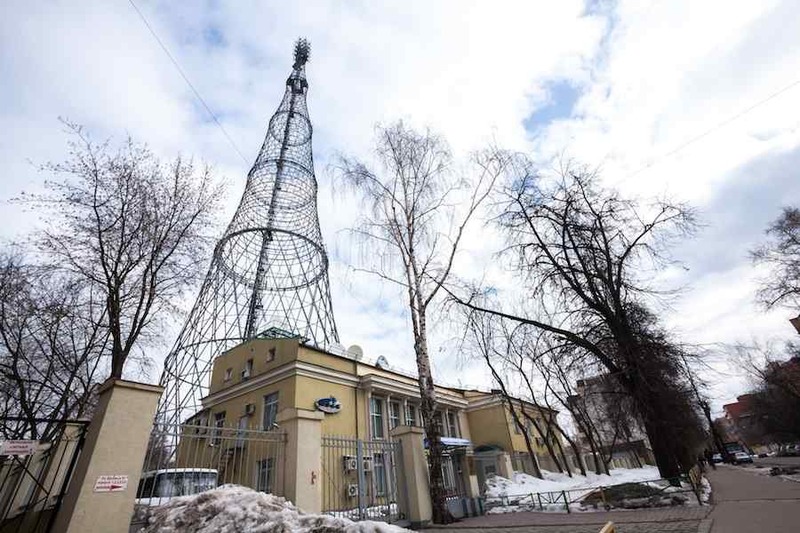 The Shukhov communication tower – CC-BSYA 3.0. Moisey Ginzburg, Narkomfin building, 1929, monument of constructivism – Photo by Oleg Green, Flickr CC.